…..news letter #570 – pos…..
well, it’s a super light week for new releases, which is as it tends to be this time of year, but there’s loads of restocks showing up so if you have been waiting for something to come back in post xmas.. it may finally be back in, and if not, maybe soon. – acid mothers leader and reynols legend meet once again for a wild psych out explosion! 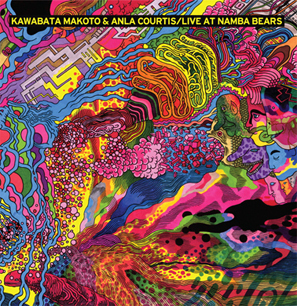 kawabata and courtis previously worked together on 2006’s kokura for riot season, here they return for a raging trip of psychedelic noise rock recorded in february 2011, in osaka, japan. both kawabata and courtis are playing guitar, but with anla bringing tapes and vocals to the mix and makoto bow and effects. namba lightbeam, the first of two 20 minute pieces, opens with a eastern sounding drone sound, much like some of kawabata’s solo work, it steadily builds into a torrent of slashing guitar riffs, eventually returning to a more minimal sound even with a more signature acid mothers guitar sound from makoto at one point with zoned vocal drones from anla. this continues onto side b with inaudible bears, with a distorted echoey haze of effects and riffs, layered over one another. this side continues to fluctuate between minimal riffs and blasts of noisier guitar destruction. limited to 300 copies pressed on 180 gram heavyweight virgin. packaged in a very fitting insane sleeve featuring absolutely wild artwork, includes download coupon. – expo ’70 has garnered a great deal of notoriety over the last few years in certain circles in which the moniker is usually mentioned to describe types of cross-genres. after completing a couple us tours and a handful of limited releases and re-releases in 2010, a short hiatus was in order. during this time last year justin wright, sole operator of the project, recorded tracks for an upcoming release. wright entered a basement studio and improvised over two nights layered recordings for the first time in several months. a track from this session was released earlier this year as the title track for sound of cobra’s “hovering resonance” one-sided limited lp. that song did not take up the full record and wright returned to the studio with his current 3 piece line-up to record “moon raga”, a more eastern-sounding influenced exploration. the edition of 200 hand silk screen covers which disappeared extremely fast. the remainder of the solo session is collected here as one full album entitled “beguiled entropy”, which explores more fidelity in sounds and texture than “hovering resonance”. soft synthesizer creeps along to explorations dominated by drifting melodic guitar leads, quickly shifting in textural atmospheres. as “beguiled entropy” is flipped to side b, the narratives drop and a more driving synth line bridges a rising pulse that takes the steering wheel in to a more cosmic psychedelic territory, adding analog drum machines leading the listener deeper into a trance-like state. pressed in an edition of 500 copies. – after a period of silence from ben, he returned earlier this year with oh lordy me (my heart is wandering again) for blackest rainbow, a record which saw him drop his guitar and create an entire lp using an ipad with the tenori-on app. perhaps an unexpected turn, but then this year has been a pretty interesting one for ben, returning to playing live after a long hiatus, surprising people by playing live in sheffield and london for separate sets with mehdi and solange from natural snow buildings as a trio, and following that he has continued to record new material for a forthcoming new project with the french duo. the mineral victim, seems in many ways like a return to the more organic sound of ben’s previous work, it’s not got the psych folk guitar sound of his debut the seventh goodbye lp, but it retains the more psychedelic drone aspects that some of the tracks had on that record. in many ways it pulls in aspects of all of ben’s work, from his early more cosmic drone experiments and psychedelic excursions, to his recent collaborations with ameziane and gularte, which will hopefully see the light of day next year… vinyl edition of only 250 copies pressed on 180 gram virgin vinyl. sleeve designed by rob lye of chora. includes download coupon for the album. – orphan fairytale emerged mid 2000s from the belgian underground which seems to be a consistently solid ground for fantastic music emerging. this brand new lp from eva van deuren’s orphan fairytale project follows on from her fantastic ‘ladybird labyrinth’ lp on ultra eczema as well as releases on rampart, foxglove, release the bats and many other great labels. ‘comets come alive’ is a beautiful dreamy album of keyboard, layered with various unknown objects, toys and other non-instruments creating a sea of sound that is so stunning it’s hard to put into words. the sounds eva creates have a childlike nursery rhyme like quality which is what makes her music so charming, it’s simplistic, but there’s not much else out there that sounds like what eva does, she blends the minimalistic with the psychedelic. ‘comets come alive’ is pressed on 180gram virgin vinyl including a download code.